Please remember the Bunche Center when you plan your Year-End Gifts and visit our Giving Page. Founded in 1969 as a result of the struggle by black students at UCLA to promote scholarship and recognition of their history and culture, the Ralph J. Bunche Center for African American Studies at UCLA has become one of the nation’s most renowned ethnic studies centers, earning widespread acclaim for its accomplishments in research and community partnership. Marshaling the efforts of some of the finest minds from wide-ranging disciplines at UCLA and beyond, the Center’s studies have informed leaders on many of the most important issues of the day: access to education, the portrayal of race in the media, and the availability of health-care services in at-risk communities, to name a few. For more than 40 years, the Bunche Center has supported multidisciplinary research that expands the knowledge of the history, lifestyles, and sociocultural systems of people of African descent, and investigates problems that have bearing on the psychological, social, and economic well-being of persons of African descent. The Center’s location in Los Angeles, the entertainment capital of the world, provides unrivaled access to the television and film industry’s leaders and key players. The Bunche Center’s position as a research unit affiliated with the interdisciplinary teaching department allows it to combine the strengths of UCLA, its renowned faculty, outstanding humanities and social science divisions, and state-of-the-art research libraries with its own distinguished assets as the premier institute on African American Studies on the west coast. The Bunche Center’s library holdings complement the collections at the major social science/humanities libraries at UCLA by focusing on book and archival collections related to African American Studies. Gifts to the Bunche Center support our commitment to teaching, research, and service, ensuring that a UCLA education remains accessible and that the caliber of its scholarship and research is peer to none. Your individual gift helps support vital research, programs and services. End-of-year giving reduces your tax bill and is a simple and effective way for you to support the mission of the Bunche Center! Gifts to the Bunche Center support our commitment to teaching, research, and service, ensuring that a UCLA education remains accessible and that the caliber of its scholarship and research is equal to none. Gifts of appreciated securities are tax deductible at their full market value. In most cases, appreciation in the value of the security benefits the Bunche Center and is not taxable to the donor. A pledge is a statement of intention to make a gift to the Bunche Center. Donors who seek to defer the bulk of their giving until a future date, or who want to give via installments over time, may use this giving strategy. Pledges are typically made in concert with a preliminary “first installment” gift and provide a source of consistent and dependable funding for the University. Real property, either in its entirety or in part, can be deeded to The UCLA Foundation to benefit the Bunche Center. For residential properties, it is possible to arrange a sizable tax deduction by deeding a home to UCLA, while continuing to occupy the property for life. In writing a will or living trust, donors can specify that they would like their estate to benefit the Bunche Center. Donors who wish to have their gifts managed by The UCLA Foundation must specifically state in their wills or living trusts that their gifts be made to The UCLA Foundation to benefit the Bunche Center. Donors may transfer money, securities, or real estate in trust to the Bunche Center and still receive income for themselves or another, for life. Donors may receive immediate tax benefits, and ultimately the Bunche Center receives the trust property. The Bunche Center gratefully accepts donations of materials that support the academic, teaching and research mission of the Center. The Center receives a wide variety of such gifts, including rare books and manuscripts, works of art, equipment and other items of value. Naming the Bunche Center as a beneficiary of your qualified retirement plan (IRA, KEOGH, 401(k) or 403(b)) may be particularly advantageous; doing so may result in more assets being passed on to your heirs than if you make a bequest from other funds in your estate. For additional information on how to make a contribution to the Bunche Center, please go to https://giving.ucla.edu/Bunche. You may also contact the Center’s director of development, Amani Roland, at 310-206-6639 or aroland@support.ucla.edu. Or, you may contact the Center directly at (310) 825-7403. On October 9, 2003, UCLA’s Center for African American Studies was renamed the Ralph J. BuncheCenter for African American Studies at UCLA. 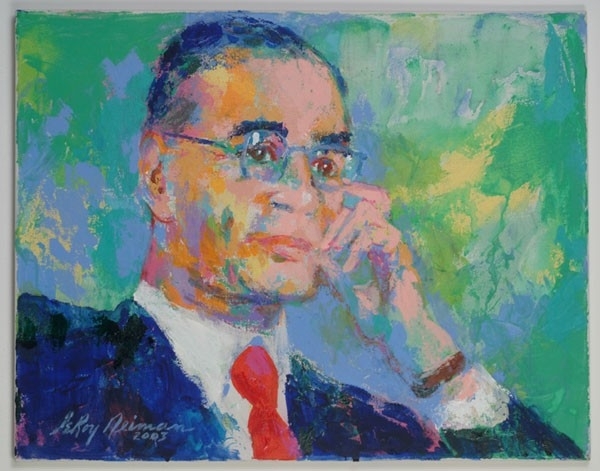 During the public ceremony, an original portrait of Bunche by celebrated artist LeRoy Neiman was unveiled and permanently displayed in the newly renamed center. 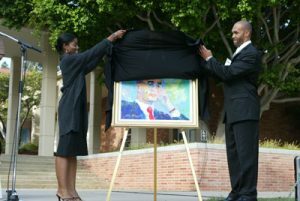 Neiman donated the portrait to the University, Bunche’s alma mater, to acknowledge the centenary of the Nobel Prize winner’s birth.